Star Wars shows up in pop culture all the time. Television shows constantly make references to the saga, it makes appearances in comics, in books, everywhere again and again. I'm still surprised by just how many times I come across references though; especially when Revenge of the Sith talk popped up in one of my favorite series - Gilmore Girls. And Luke makes a completely valid point about the high ground. LUKE: And they have those flashlight thingies. LORELAI: Yeah. That’s the right name for those. Flashlight thingies. LUKE: And Jedi powers of mind control, they can move things, so they’re telekinetic, and they hover their jet saucers over molten lava, and they jump and fly around like they’re in Cirque du Soleil. LORELAI: Dude, if he said it, that’s the way it is. It’s a fictional world. LUKE: He’s four feet up a little slope! And that wipes out all the other guy’s powers? The fly, jump around, move things with his brain, use the little flashlight thingy? LORELAI: You have got to learn the right term for that flashlight thingy. LUKE: This has been bugging me. LORELAI: For months! We saw that movie months ago! You’ve got to let it go! LORELAI: George Lucas owns San Francisco now. That’s a city. You can’t argue with a man who owns a city. LUKE: All the other guy has to do is scurry on to land and run up the hill a bit, and then he has the high ground. I mean, they can fly jet pods, but they can’t scurry? LORELAI: Go on a website or something, okay? ‘Cause there are thousands - no, millions of your kind out there debating all the minutiae of not just this Star Wars movie, but every Star Wars movie. 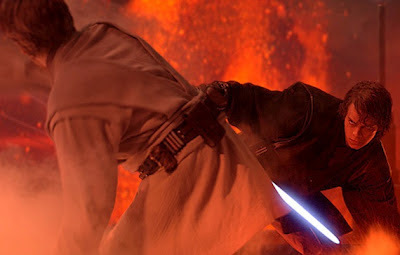 I have always thought it was strange that a relative position that happens a bejillion times in nearly every lightsaber duel, including that one, should suddenly be such a crucial thing. It's kind of a weak way to enact one of the series' most pivotal plot points. It's never much bothered me, because if I didn't shrug and say, "Lucas wrote the script" to it and the many holes like it, the movies would be entirely unwatchable. Well... they are clearly evenly matched. They jump and chase eachother across half the installation without managing to hit eachother. So that one small advantage is what decides it. Maybe Anakin could have won if he had another trick up his sleeve, like having learned force lightning or something. Instead he tried the same trick Obi-Wan used against Darth Maul in Episode 1. A trick Obi-Wan naturally is prepared for. Also various other chinese coins yet additionally binance login Binance Official Site, App & Login Not Working are concluded.